Technology is disrupting virtually every industry in some way, and a business case for digital literacy on the board is emerging. 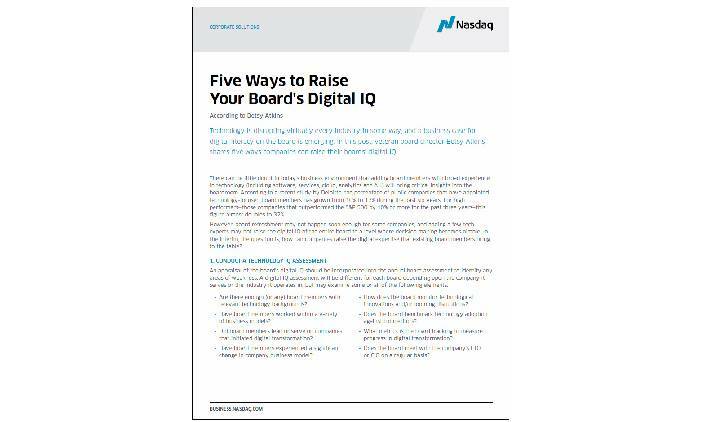 In this post, veteran board director Betsy Atkins shares five ways companies can raise their boards’ digital IQ. There can be little doubt in today’s business environment that adding board members with broad experience in technology (including software, services, cloud, analytics and A.I.) will bring critical insights into the boardroom. According to a recent study by Deloitte, the percentage of public companies that have appointed technology-focused board members has grown from 10% to 17% during the past six years. For high performers—those companies that outperformed the S&P 500 by 10% or more for the past three years—this figure almost doubles to 32%.However, board refreshment may not happen soon enough for some companies, and adding a few tech experts may not raise the digital IQ of the entire board to a level where decision making becomes nimble. In the interim, the question is, how can companies raise the digital expertise that existing board members bring to the table? • Are there enough (or any) board members with relevant technology backgrounds? • Have board members worked within a variety of business models? • Did board members lead or serve on companies that initiated digital transformation? • Have board members experienced a significant change in company business model? • How does the board monitor technological innovations and/or looming disruptions? • Does the board benchmark technology adoption against competitors? • What metrics is the board tracking to measure progress in digital transformation? • Does the board meet with the company’s CTO or CIO on a regular basis? Every company is a technology company in some way, and all boards should be continuously researching macro trends in technological innovation and digital enablement. An effective way to boost the entire board’s digital IQ quickly is a technology learning tour, during which board members spend a few days immersed in one of the major technology hubs, such as Silicon Valley, China, or Tel Aviv. The board I sit on at Schneider Electric just toured Alibaba in China. We also visited leading Chinese companies in Shanghai, Hangzhou, Shenzhen, and Hong Kong. This fall, I joined my fellow Volvo board members in meetings with Google, Amazon, venture capital groups in Menlo Park, and other cloud services providers as we seek to understand the potential for connected car infotainment. We also met with companies that specialize in machine learning and AI algorithms related to autonomous driving,to discern how advances in those technologies may apply to Volvo.There are major macro tech trends impacting Schneider and Volvo that require their boards to establish a framework of tech knowledge in order to adequately leverage the opportunities these trends present. Schneider for example is an industrial energy management company, and board member knowledge of—and experience with—the industrial internet of things is critical as “hardware”companies like Schneider transition to develop and embed software in their infrastructure. For Volvo,cloud services, infotainment, SaaS Software, the digital customer journey, and machine learning/Algorithms for autonomous drive are all macro trends that are directly relevant to the company’s business. Continuing education can take place in the boardroom as well as outside of it. Boards can engage external digital experts to update members about emerging tech-related innovations, disruptions and risks. Boards should also monitor how competitors are leveraging technology to delight consumers, bring efficiencies to supply chains, and lower costs.The Governance Committee of HD Supply brings in outside speakers two or three times a year for a working dinner. We’ve had cyber-risk speakers fr FireEye and digital transformation speakers from Accenture and Boston Consulting Group. An up coming speaker will be presenting an in-depth discussion of competitive industry assessment.Internal company technology officers and department heads are also indispensable subject matter experts,and the board should be hearing regularly from the company’s top digital managers. (I recently wrote a piece about the evolving role of the CIO.) The Volvo board’s Technology and Innovation Committee regularly receives updates from Volvo’s head of research and development, Chief Digital Officer,head of product development, and global head of strategy. Schneider has created a role of Chief Digital Transformation Officer reporting to the CEO.The Schneider Board will consider adding a Digital Oversight Committee. There is a lot of buzz right now about cyber risk and how boards should manage oversight of that—and rightly so. However, companies today face a much greater risk than data breaches and ransomware attacks: business model obsolescence. According to a study published by Innosight, businesses are disappearing at a rate of 50% every 10 years,primarily because they don’t evolve quickly enough in the face of seismic shifts in consumer behaviors or technological innovations (think Blockbuster,Borders, and Radio Shack). Tenure on the S&P 500 has dropped from 33 years to 14 years during the past 7 years.Companies that seek opportunities for competitive advantage in evolving technologies will have the greatest chance of survival. To ensure business model vibrancy, boards need to embrace tech trends and new business models, and actively consider integration of them into their companies’strategies. Board agendas should allocate time to digital transformation, just as they do cyber,general enterprise risk management and other risk mitigations. Digital transformation is a forward-looking perspective, so it shouldn’t be tasked to the audit committee (which is traditionally backward-looking).Governance committees, on the other hand, often have additional capacity to absorb tech-related strategic oversight. Governance is the board committee charged with oversight of strategic digital transformation at HD Supply. As Deloitte reported in the study I referenced at the beginning of this article, it is becoming more common for boards to add technology committees dedicated to digital and technical transformation. Volvo’s board has a Technology Innovation Committee,and the Schneider Electric board formed a Digital Transformation Committee. The velocity of change is so intense now that corporate survival depends upon the intellectual and emotional experience of people who are more comfortable leveraging change than pulling away from it. To be effective, every director today needs to have past experience navigating a company through rapid and truly transformative change.It’s also important that directors in today’s business environment have job experience within a variety of enterprises and business models. If every one around the boardroom table spent their entire career immersed in a single corporate domain or business model, the board may lack familiarity with change or the conviction to innovate. They will try to apply the one lens or framework that was effective one or two decades ago. Board members who have worked for multiple companies during their careers are more likely to have experience leveraging technologies to refresh or retool business models, bring down costs,or improve the customer journey.